KUMASI, Ghana, June 20 - Ghana skipper Stephen Appiah took advantage of a calamitous South Africa defence to score twice and steer his country to a 3-0 win in their World Cup Africa zone group two qualifier on Sunday. The Juventus midfielder scored both goals in the second half, taking advantage of mix-ups between South African central defenders Mark Fish and Nasief Morris on a bumpy pitch. Udinese midfielder Sulley Muntari opened the scoring for Ghana when he slammed home a thunderous volley from a Dan Quaye cross in the 14th minute to ignite the passions of the home crowd in Kumasi. Appiah then added two more, getting the first in the 55th minute with a chip over South African goalkeeper Moeneeb Josephs after Morris had failed to clear a bouncing cross. 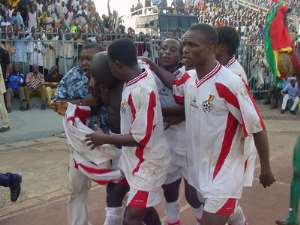 Appiah's second goal was also an opportunistic effort after another mix-up in the heart of the South African defence. Appiah ran directly at the defence and after his pass was cut out by Morris, Fish made no attempt to clear the ball and the home captain was perfectly placed to collect it again and score. 'They (Ghana) dealt with the conditions much better than we did. Football is a game of confidence and while Ghana grew in the game with confidence we died out there,' said South African coach Stuart Baxter. It was the first time Ghana had beaten South Africa in six meetings and the result puts them top of the group two standings on goal difference. Burkina Faso, DR Congo, Cape Verde Islands and Uganda are also in the group WORLD CUP PAGE (VIDEO)South African Version: South Africa have suffered a humiliating 3-0 loss to Ghana in their Group 2 World Cup qualifier played in Kumasi, Ghana today. This is the second match in the qualifiers, and if the match is anything to go by, then Bafana Bafana have a lot of work to do ahead of the remaining matches. This is the first time the Black Stars have defeated South Africa in six games. The week started horribly for Bafana Bafana with players withdrawing from the squad. It ended in misery, beaten convincingly by the Black Stars. The first goal came in the 14th minute. Some say the pitch was terrible, but Bafana Bafana looked disjointed and Ghana dictated terms the whole 90 minutes. South Africa did have a rare opportunity to score through Steven Pienaar, but nothing came of it. Whatever was discussed at halftime in the change room did not work, as it was Ghana who extended their lead in the 55th minute. Bafana Bafana did not look impressive when they beat Cape Verde 2-1 in Bloemfontein a fortnight ago. They have now been exposed by Ghana - a team they have not lost to before, and it was not a surprise when the third goal came in the 77th minute. Bafana Bafana's next match is against Burkina Faso early next month.